The Montreal Maroons hockey team was created to appeal to the anglophone neighbourhoods of Montreal. On January 2, 1918, the Montreal Arena, shared by the Montreal Canadiens and the Montreal Wanderers, burnt down. The Canadiens, who drew primarily Montreal's francophones, moved to the Jubilee Arena which, in 1919, also burnt down, before settling in the Mount Royal Arena, which had natural ice and seating for 3,250. The Wanderers, team of Montreal's anglophone community, folded. By 1922, work began to build a team to appeal to the anglophones and return to the NHL. In July 1924, construction began on a new arena, on the site of a former roller-skating rink known as the Forum. By fall, at a cost of $1.5 million, the Montreal Forum was complete. The Montreal Forum was the first large arena in the NHL. The Maroons joined the NHL in 1924, along with the Boston Bruins. The Canadiens initially objected to a second team in Montreal, but relented when compensated by the expansion fee. The expansion fees for each team was $15,000. $11,000 of the Maroons' fee went to their local rivals, the Canadiens. While the Canadiens owner initially lodged a formal objection to ensure he would get adequate compensation for sharing his franchise's territory, he was actually quite enthusiastic about having a second franchise in the same city; rather, he would later state, he "saw in them an important and lucrative local rivalry." At the time of their founding, the Maroons had no nickname. The Maroons' president James Strachan had been the owner of the Wanderers in the 1900s. He attempted to secure the Wanderers name, but negotiations failed, so the club was known by its official name, the Montreal Professional Hockey Club. The Maroons nickname was eventually picked up by the media, after the colour of their jerseys. The club never officially changed the organizational name to incorporate the Maroons name. The Vancouver Millionaires of the Pacific Coast Hockey Association had changed their name to the Vancouver Maroons, but that club had folded before Montreal began. In the Maroons' first season of operation they finished second last in the league. However, the new Forum was selling out and, with the addition of players Nelson Stewart, Babe Siebert and Bill Phillips, success came quickly. In a single year, the Maroons went from having their worst record in franchise history to their best. In only their second season of operation, Montreal won their first Stanley Cup. The NHL playoffs that year were a two-game total-goals format. Montreal won the opening series over the Pittsburgh Pirates 6–4, then upset the favored Ottawa Senators 2–1. In the NHL playoff final, Montreal defeated Ottawa to advance to the Stanley Cup final, against the Victoria Cougars of the Western Hockey League. In the last Stanley Cup final involving two different leagues, Montreal defeated Victoria three games to one. Contributing to the victory was rookie, and future Hall of Fame member, Nels Stewart, who scored six of the Maroons' ten goals in the series. Stewart won the Hart Trophy for most valuable player. While not a smooth skater, Stewart compensated with size (at six foot one and 195 pounds, he was a giant compared to other players of that era), toughness (amassing 119 penalty minutes), and shooting (scoring 34 of Montreal's 91 goals during the season). Stewart's 34 goals remained an NHL record for rookies until the 1970–71 season. During this era, a team's best players often played the entire game with substitutions only made for injuries. For the 1926–27 season, the NHL expanded to ten teams and was divided into American and Canadian divisions. The Maroons finished third in the Canadian division, behind their rivals the Canadiens, with whom they now shared the Forum. The two teams met in the playoffs for a two-game total-goals series. The forum was packed with 11,000 fans, in a building whose capacity was listed at 10,000, to watch the Canadiens defeat the defending Stanley Cup champions. The Maroons also participated in another moment of hockey history when, on November 26, 1926, they were the competition in the New York Rangers' NHL debut game. The Maroons got revenge on the Canadiens in the 1927–28 season, by eliminating them in the semi-finals of the playoffs. The Maroons then met the New York Rangers for the Stanley Cup, but lost the series three games to two. Because the circus occupied Madison Square Garden, all five games were played at the Forum. Hooley Smith, rightwing on the "S Line"
Babe Siebert, left-winger on the feared "S Line"
The 1928–29 season was a rare bad one for the Maroons, as they finished last in the Canadian division. However, they rebounded in the 1929–30 season, by finishing first. During these years, the Maroons were led by one of the most feared forward lines in the early NHL years, the "S Line", consisting of Hooley Smith, Babe Siebert and Nels Stewart, which was also one of the most penalized. In the 1929–30 season, Dunc Munro was signed as player-coach of the team. It was during this season, that Clint Benedict of the Maroons became the first goaltender in NHL history to wear a mask, when he donned one to protect a broken nose. Although the Maroons finished first in the Canadian Division, they were eliminated in the first round of the playoffs by the Boston Bruins. 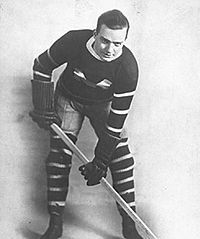 For the 1930–31 season, Stewart again led his team in goals and points, but the Maroons only finished third in the Canadian division, and were eliminated easily in the first round of the playoffs by the New York Rangers. The Maroons made it into the playoffs of the 1931–32 season, by finishing five points ahead of the New York Americans. Montreal defeated Detroit in the opening round, but lost the semi-final match against the Toronto Maple Leafs. The Maroons finished the 1932–33 season in second place in the Canadian division and even had three of the top six players in league points. However, Montreal was eliminated in the first round of the playoffs by Detroit. In the playoffs of the 1933–34 season, the Chicago Black Hawks eliminated both Montreal teams, first defeating the Canadiens, then upsetting the Maroons in the semi-finals. In 1935, Leo Dandurand, owner of the Montreal Canadiens, sold that team to Canadian Arena Company, (Ernest Savard, Louis Gelinas and Maurice Forget), which also owned the Montreal Maroons, for $165,000. In Montreal, financial strains from the Great Depression hurt the attendances of both the Canadiens and Maroons. However, there were far more francophone supporters for the Canadiens than anglophone supporters for the Maroons. As a result, the Maroons finished with the worst attendance in the league, three seasons in a row. Also, by 1935, both teams were owned by Canadian Arena Company. (Ernest Savard and Maurice Forget, who owned the Canadiens, were part of the Canadian Arena Company, as were Maroons owners James Strachan and Donat Raymond). It became obvious that only one team could represent Montreal. The Maroons' dire financial straits caused them to sell off several players, including star winger Hooley Smith. Despite the Maroons' financial troubles, they continued to play competitive hockey well into the 1930s. Tommy Gorman, coached Maroons to their second Stanley Cup. By coaching Chicago to the Cup the previous year, Gorman is only coach in history to win the Stanley Cup back-to-back with different teams. For the 1934–35 season, the Maroons hired Tommy Gorman as coach, who had coached the Chicago Black Hawks to the Championship the previous year. The Maroons finished the season in second place behind Ottawa. In the playoffs, the Montreal Maroons defeated Chicago with defensive hockey, defeated the New York Rangers at wide-open (offensive) hockey, and then defeated the Toronto Maple Leafs, who Gorman considered as one of the best hockey teams of all time, in three straight games. The Maroons won their second Stanley Cup; Gorman remains the only coach in history to win back-to-back Cups with two different teams. The Maroons team were the last team to win the Cup without a loss in the playoffs for 17 years. Gorman called this Maroon team "the greatest team that ever stepped on the ice." The playoffs of the 1935-36 season are famous for the longest NHL playoff game of all time. On March 24–25, the Maroons lost 1–0 to the Detroit Red Wings in 176:30 of play (16:30 of the sixth overtime period). The game was especially significant for Detroit goaltender Normie Smith, who began his career with the Maroons. He shut out the Maroons again in the second game, and allowed Detroit to complete a three-game sweep by allowing only one goal. Detroit proceeded to win the first Stanley Cup in their history. In December 1936, Maroons captain Hooley Smith was traded to the Boston Bruins, a move which would mark the beginning of the end for the franchise. The 1936-37 season saw Nels Stewart break Howie Morenz's record for career goals with 271. Stewart would hold the all-time career record for goals until it was broken by Maurice Richard in 1952. By the start of the 1937–38 season, rumours were rampant that the Maroon franchise would be moved to another city. In September 1937, Maroons president Donat Raymond said the team would be staying in Montreal. The team's bleak financial situation finally caught up with them as they finished 12–30–6, the club's worst season since winning only nine games in 1924–25. Lionel Conacher retired prior to the season to enter politics, winning a seat in the 1937 Ontario general election as a member of the Liberal Party. Tommy Gorman had tried to convince Conacher to stay with the Maroons and take over as coach, his retirement led Gorman to hire King Clancy. Clancy did not help improve the team's record, and on December 29 he was fired after 18 games and Gorman was re-instated as coach. Their last game for the Maroons franchise, was a 6-3 loss on March 17 against the Canadiens. They finished the season with a record of 12 wins, 30 losses and 6 ties for 30 points in 48 games, placing the team last in the Canadian Division and last overall in the league. At the annual league meeting on June 22, the Maroons formally asked the league to suspend the franchise for a year; this was refused, and the league asked the Maroons to confirm by August 1 if they were to participate in the upcoming season or not. The league allowed the Maroons to suspend operations for the 1938–39 season. Although it was not formally considered to be a merger unlike the much later fusion of the Minnesota North Stars and Cleveland Barons organizations, from a hockey operations perspective the transaction had the outward appearance of being a merger[according to whom?] since the owners subsequently transferred most of the Maroons roster to the Canadiens. The Maroons' owners tried to sell their dormant franchise to interests in St. Louis, Missouri, but doubts regarding the previous failure of the St. Louis Eagles led to the league refusing permission. At the 1945 annual league meeting, held on September 7, it was noted that the backers of the Maroons franchise were in discussion to sell to a group from Philadelphia fronted by Canadiens board member Len Peto. The league governors were prepared to approve the transfer, provided the Philadelphia group could prove they had the necessary funds for a hockey team. They also made sure to clarify that the Maroons franchise rights would expire in April 1947 unless something was done with them. Peto was able to get the necessary funding, and persuaded the league to transfer the Maroons to Philadelphia. However, despite being larger than all but two NHL cities, Philadelphia did not have an arena that could accommodate an NHL team. The city's largest arena, the Palestra at the University of Pennsylvania, did not have an ice plant, and both Penn and Madison Square Garden (which managed the Palestra) balked at the expense of installing one. The only arena in the city with an ice plant, Philadelphia Arena, was ruled out because its sight lines and capacity (5,500) were deemed inadequate even for temporary use. The league gave Peto until the end of the 1946–47 season to find a suitable arena. In February, 1946 Peto announced plans to build a 20,000-seat arena on the site of the old Baker Bowl at a cost of $2.5 million. However, when his group was unable to get funding for the project by the league-imposed deadline, the NHL cancelled the Maroons franchise. The last active Maroons player was Herb Cain, who remained in the NHL until 1946. Montreal Forum — built specifically for the Maroons; the Forum would become the most famous arena in hockey largely because of the Canadiens, who shared the arena with the Maroons from 1926 to 1938. ^ Coleman, Charles L. (1964). The Trail of the Stanley Cup, Vol I. Kendall/Hunt. ^ a b c d Diamond, Dan; Zweig, Eric (1998). Total Hockey. National Hockey League. p. 207. ISBN 0-8362-7114-9. ^ a b Wright, Marshall D. (2010). The National Hockey League, 1917–1967: A Year-by-Year Statistical History. MacFarland & Company. p. 57. ISBN 978-0-444-47864-1. ^ Weekes, Don (2005). The big book of hockey trivia. Greystone Books. p. 223. ISBN 978-1-55365-119-2. ^ Dryden, Steve (2000). Century of Hockey. The Hockey News. p. 28. ISBN 0-7710-4179-9. ^ Duplacey, James; Diamond, Dan (2000). The Official Rules of Hockey. The Lyons Press. p. 32. ISBN 978-1-58574-052-9. ^ Kreiser, John; Friedman, Lou (1996). The New York Rangers:Broadway's Longest-Running Hit. New York Rangers. p. 3. ISBN 1-57167-041-6. ^ "The Legends: Clint Benedict". Hockey Hall of Fame. Retrieved Feb 18, 2011. ^ "1929-30 Montreal Maroons Schedule and Results". Sports Reference. Retrieved October 12, 2016. ^ Skog, Jason. The Story of the Chicago Blackhawks. Creative Education. p. 14. ISBN 978-1-58341-615-0. ^ a b c McFarlane, Brian (1969). 50 Years of Hockey. Greywood Publishing Ltd.
^ a b c Coleman, Charles L. (1969). The Trail of the Stanley Cup, Vol II. Progressive Publications. ^ a b McNeil 1935, p. 14. ^ Goodman, Michael E. (2009). The Story of the Detroit Red Wings. Creative Publications. p. 11. ISBN 978-1-58341-617-4. ^ "Hooley Smith biography". Hockey Hall of Fame. Retrieved April 2, 2011. ^ Diamond, Dan; Zweig, Eric (2001). Ice Q and As: a century of hockey intelligence. Andrews McMeel Publishing. p. 62. ISBN 0740719025. ^ Canadian Press 1937, p. 14. ^ Vancouver Sun 1937, p. 7. Wikimedia Commons has media related to Montreal Maroons. This page was last edited on 24 February 2019, at 16:03 (UTC).